In small bowl, mix Sauce ingredients. Place half of the sauce in a small serving bowl for dipping; set aside. Line cookie sheet with paper towels. Place 1/4 cup of the flour in medium bowl. In small bowl, beat egg and 2 tablespoons soy sauce. In large bowl, stir together remaining 1/2 cup flour, the cornstarch, ginger, garlic powder and salt. Add chicken tenders to medium bowl with flour, and toss to coat; shake off excess flour. Add chicken to egg mixture, then add to flour and cornstarch mixture; toss to coat. Discard any remaining breading ingredients. In 12-inch skillet, heat vegetable oil over medium-high heat until hot. Reduce heat to medium. Cook chicken in two batches in oil 5 to 7 minutes, turning once, until chicken is no longer pink in center. Transfer chicken to cookie sheet. While chicken is still hot, brush tops with remaining sauce. Immediately sprinkle with sesame seed. Serve with reserved sauce for dipping. For best results, allow oil to get hot again between batches. Need a little green? 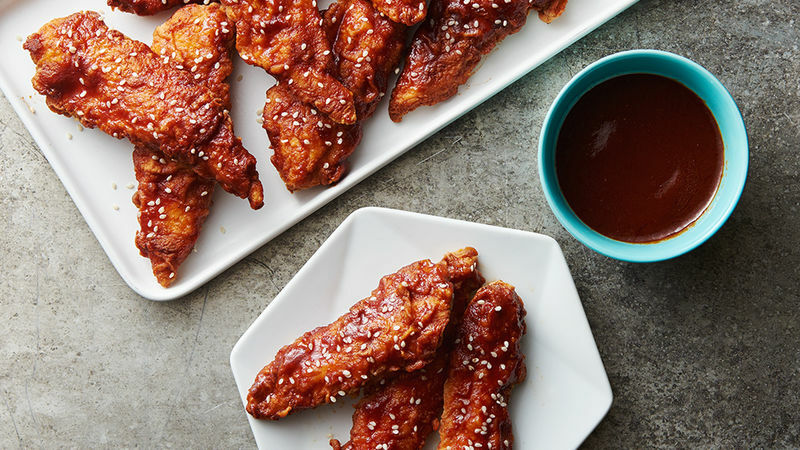 Traditional Korean fried chicken is often topped with thinly sliced green onions. If desired, sprinkle some on the chicken after brushing with the sauce.